Elite Football in Maribyrnong is Melbourne’s ultimate indoor soccer experience. The project was to create a stunning audio visual showpiece for their new facility. 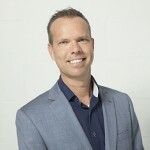 Vision One Technologies collaborated with the team at Elite to realize this task. The total project took 8 months to complete. 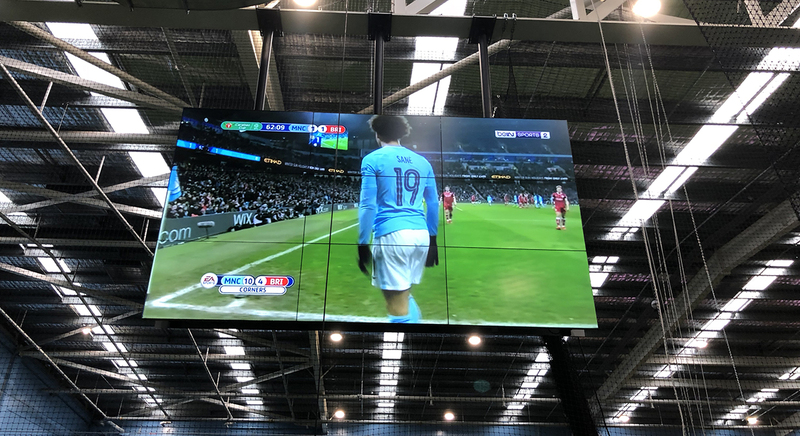 Combining a video wall, LED advertising signage displays, digital scoreboards and other AV solutions, the total project at Elite Football gives a breathtaking and virtual football experience. The displays were mounted with Vogel’s solutions, which thereby contributed to the perception that this indoor facility is in fact a spectacular outdoor football stadium. 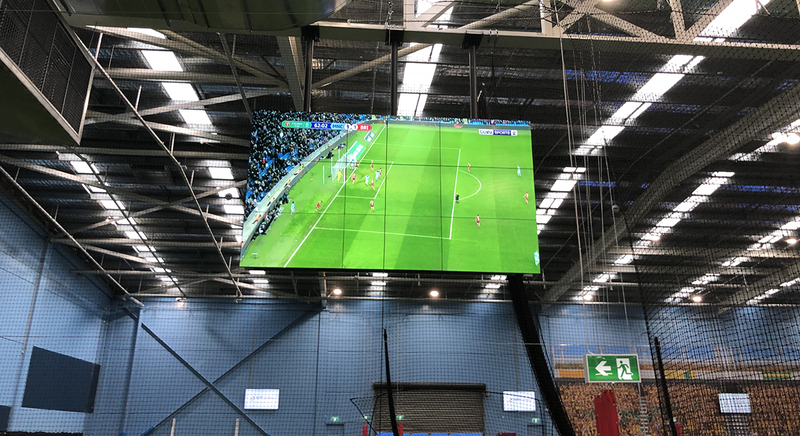 The team at Elite Football were in the market for an innovative audio visual solution that could act as the showpiece for their state-of-the-art indoor football/soccer training facility. With a clear vision in mind, the team at Elite collaborated with Vision One to create a configuration that included a mammoth 3x3 video wall, LED advertising signage displays, digital scoreboards and meeting room presentation displays. What's so special about this project? 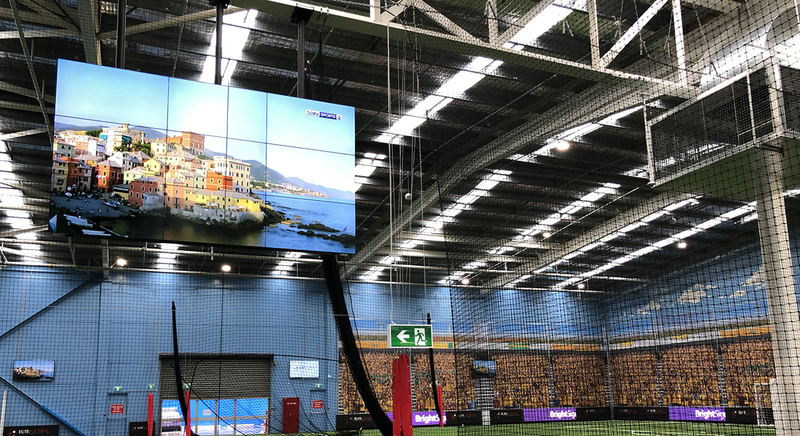 Stealing the show and hanging 6 metres above the artificial turf below, 9x Philips Video Wall Display Panels (3 x 3 configuration) were hung on a Vogel’s custom mounting solution. This 3 x 3 video wall is hanging free from the existing H-beam, to create a dynamic and centralised visual display at the entranceway of the facility. The video wall primarily transmits content from Foxtel’s beIN Sports and Optus’ Fetch box. The project was realized in corporation between our Australian importer Canohm together with Vision One Technologies. 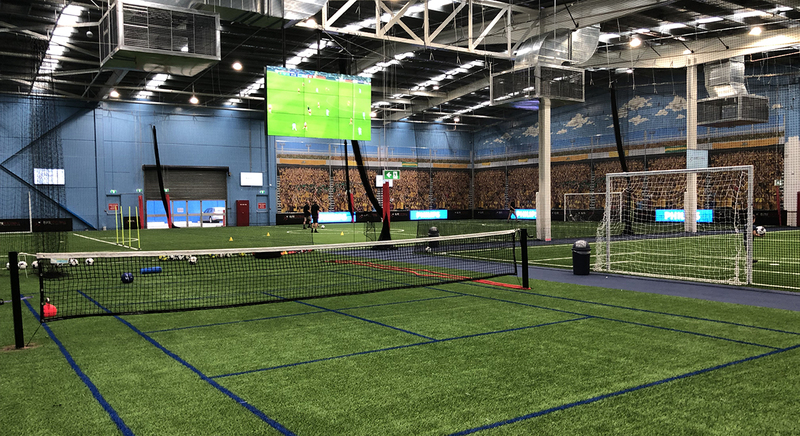 Client (and peer) feedback has been exceptional with the state-of-the-art facility dropping the jaws of every visitor (including high profile Australian National Team footballers like Archie Thompson and Ivan Franjic). Visually, the facility is nothing short of stunning. Vision One Technologies was very satisfied with the possibilities and custom mounting solutions Vogel’s was able to offer.